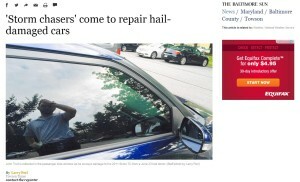 A recent Baltimore Sun post gives an interesting perspective on the lives of “storm chasers” who seek temporary work from auto body shops overwhelmed with catastrophic hail claims. They’re not your dreaded “I can pound that out for $50” shady parking lot competitors, according to the article from the Towson Times, a weekly newspaper owned by the Sun’s parent company. Instead, the piece paints them as qualified technicians who choose a life on the road instead of a shop and are welcomed by the dent repair and auto body businesses contract with them. Dent Guys owner Shaun Sutton, whose company has been working out of a Mercedes dealership after a Maryland storm, told the newspaper he hired 25 out-of-staters, including those with whom he has worked since 1999. Jason Rommel, manager of Hunt Valley Auto Body, told the newspaper that his company received 200 calls for work in two hours and and it was glad for the interest during the shop’s “stressful time.” He said he couldn’t recall a similar out-of-town response during an earlier 2007 storm, according to the Times. Some of the “storm chasers” will travel to other continents for work, and they’ll usually stay in an area until room and board — which one contractor said could hit $3,000 a month — costs more than the hail paychecks, according to the Times.